Links will open a new browser tab or window. Over 40 years of tradition on Mt. Rainier and we're proud to continue that tradition by carrying JanSport packs around the world. The only tents you want for high camp on Mt. Everest. These guys outfit our guides from head to toe. You hope to never need it, but when you do it's nice to have the best stuff on the market in your pack. From Papua New Guinea to Kathmandu, CTT can book the flights you need. They know our programs and will take good care of you. 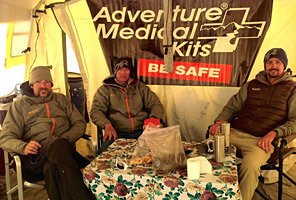 IMG guide Peter Anderson's wilderness medicine training company. Fine art prints, Mt. Rainier photography classes, and more by IMG guide Adam Angel. Houses artifacts on loan from the 2001 Mallory & Irvine Research Expedition. CDC international travel info: vaccinations etc. Information on climbing and skiing in Mt. Rainier National Park. Maintained by NPS Climbing Rangers. Mountains of Central Asia Digital Dataset (MCADD) consists of a collection of books, journals and maps related broadly to the Himalayas. International Mountain Guides is committed to preserving our world's natural areas through our partnership with Leave No Trace. I have to say, in my opinion, IMG ran one excellent expedition! I have done and do many sports that can get very dangerous very quickly if they are not managed correctly or respected accordingly. You nailed it!